73.9% of the OTW's expenses go towards maintaining the AO3. This includes the bulk of our server expenses—both new purchases and ongoing colocation and maintenance—website performance monitoring tools and various systems-related licences (access all program expenses). This year, we implemented a significant server overhaul costing about US$115,000. This overhaul focused on new database servers for AO3 works, comments, and activities, as well as a new server rack for them to live on. The new servers also increased our monthly colocation expenses, while the old machines are being repurposed as application servers, which generate the Archive's pages and serve them to users. Previously, US$100,000 was budgeted for contractor services. However, testing, fixing bugs, and tweaking behavior for our Elasticsearch update took considerably longer than expected, giving us less time than we'd hoped to merge code written by contractors into our code base this year. Therefore, we chose not to contract out any more projects and focus on deploying the code we'd already paid for and that had been submitted by our volunteers. 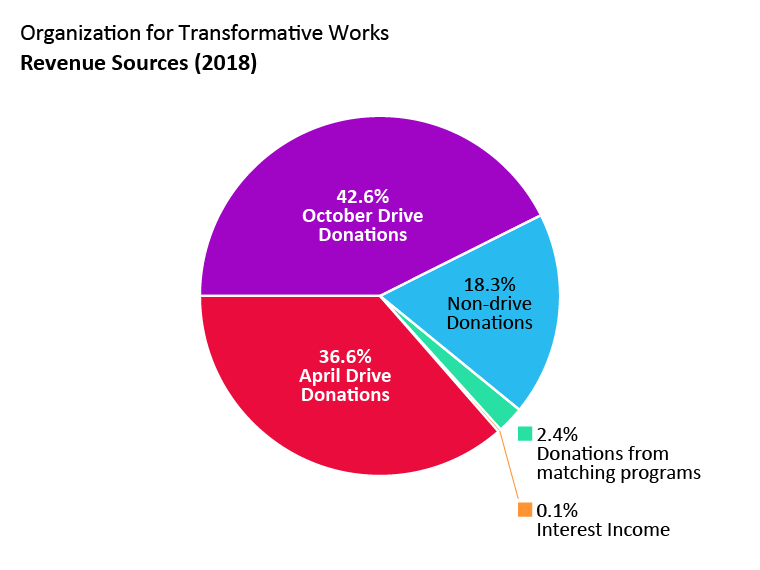 We receive most of our donations each year in the April and October fundraising drives, which together should account for about 73% of our income in 2018. We also receive donations via employer matching programs, royalties, Amazon Smile, and PayPal Giving Fund, which administers donations from programs like Humble Bundle. If you'd like to support us while making purchases on those websites, please select the Organization for Transformative Works as your charity of choice! Given your generosity in previous years, we have a healthy amount in reserves, which we plan to keep in store for a rainy day. Thanks to this, we can explore alternative revenue sources to supplement your donations. The Finance team and the OTW board have decided on a conservative investment portfolio for a small portion of our funds to start with, which will place the initial investment at as low a risk as possible. This move is long overdue, and we're currently working on creating a solid policy regarding investment and usage of our reserves in place. The reserves also help bolster us in years when we're planning larger than usual purchases. As mentioned earlier, we have already replaced our old server hardware, and had to withdraw money from reserves to aid in the purchase of servers. However, with the revenue from the rest of the year, which includes the October drive, the net amount used from reserves should be US$30,000. If you have any questions about the budget or the OTW's finances, please contact the Finance committee. We will also be hosting an open chat to answer any questions you may have. This chat will take place in our public chatroom on October 14th from 6 to 7PM UTC (what time is that in my timezone?). Here is the link to the chatroom. Come chat with us, and bring your questions! 2017 was another busy and productive year for the OTW’s Finance team! We’ve continued to improve the efficiency of the organization’s financial policies and adherence to standard accounting practices. We started our first ever audit of financial statements, which concluded in early 2018. You can check out our audited financial statements for 2015 and 2016 on the OTW Finance page. We're now preparing for the audit of our 2017 financial statements, which should start within a few weeks. This year's projected AO3 expenses include US$100,000 in contractor costs. We're quite pleased with our contractor’s work on the Archive's Rails and Elasticsearch upgrades and look forward to continuing to work with them on other projects. In addition to contracting costs, AO3 expenses include a significant server overhaul to the tune of around US$96,000 in total. This overhaul focuses on new database servers for AO3 works, comments, and other activities, as well as a new server rack for them to live on. The new servers should also increase our colocation expenses, while the old machines will be repurposed as application servers, which generate the Archive's pages and serve them to users. We receive most of our donations each year in the April and October fundraising drives, which together should account for about 79% of our income in 2018. We also receive donations via employer matching programs, Amazon Smile, and PayPal Giving Fund, which administers donations from programs like Humble Bundle. If you'd like to support us while making purchases on those websites, please select the Organization for Transformative Works as your charity of choice! Given your generosity in previous years, we have a healthy amount in reserves, which we plan to keep in store for a rainy day. Thanks to this, we can explore alternative revenue sources to supplement your donations. The Finance team and the OTW board have decided on a conservative investment portfolio for a small portion of our funds to start with, which will not place the initial investment in any risk. This move is long overdue, and we're glad to have a solid policy regarding investment and usage of our reserves in place. If you have any questions about the budget or the OTW's finances, please contact the Finance committee. We will also be hosting an open chat to answer any questions you may have. This chat will take place in our public chatroom on April 21 from 8 to 10PM UTC (what time is that in my timezone?). [Edit:] The chat has now ended. Thanks to those who came by and asked questions! 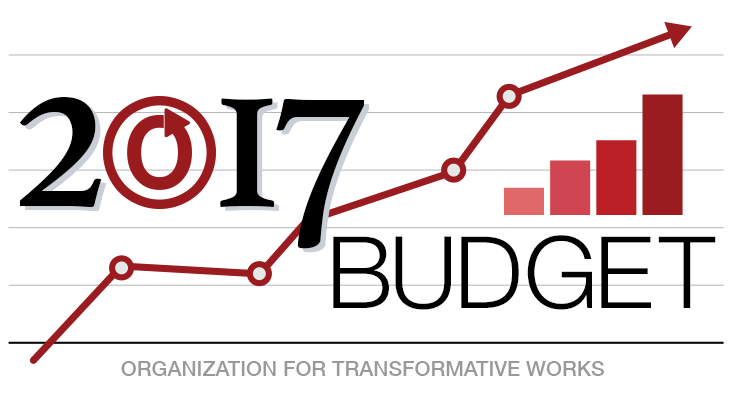 Earlier this year, the Organization for Transformative Works (OTW) published its budget for 2017. As December draws closer, we'd like to give you an update on our financial outlook for the rest of the year, and how our plans have progressed or changed since a few months ago. Our Finance team is currently preparing for the OTW's first audit of financial statements, in what we expect will become a regular annual process going forward. Given the size of our organization and our donors' generosity, it's important for us to make sure that our bookkeeping and internal controls are as efficient and thorough as they can be. We're very grateful to have the stability and revenue required for this undertaking. Thanks to our donors for making this possible! As usual, the majority of the OTW's expenses—a projected 72% of this year's total—goes towards maintaining the AO3. This includes the bulk of our server expenses—both new purchases and ongoing colocation and maintenance fees—plus contractor work, website performance monitoring tools, various systems-related licences and training (access all program expenses). We continue to work with coding contractors on structural improvements for the AO3, and there's been a lot of progress throughout this year, such as our much-needed Rails upgrade! Check out the Archive's latest release notes for information on our most recent deploys. TWC's expenses are its allotment of server costs, as well as the journal’s publishing and storage fees (access all program expenses). Our convention outreach expenses consist of preparing and shipping promotional material related to the OTW and its projects for volunteers to share with other fans at conventions. This year we've done a meet-up during San Diego Comic-Con and a technical talk about the AO3's systems infrastructure at Nine Worlds (access all con outreach expenses). The OTW Finance team is investigating options for a sustainable plan to invest the OTW's current reserves; our forecasted income should be enough to cover this year's expenses without requiring emergency withdrawals from our reserves. If you have any questions about the budget or the OTW's finances, please contact the Finance committee. We will also be hosting an open chat to answer any questions you may have. This chat will take place in our public chatroom on October 15 from 7PM to 9PM (what time is that in my timezone?). This post will be updated with a chatroom link a few hours before the appointed time. Come chat with us, and bring your questions! 2016 was a busy year for the OTW's Finance team, and we're hard at work improving the organization's bookkeeping and financial policies. Budgeting is another area where we've improved in the past few months—especially with regards to collaborating with our various teams to project their likely expenses and accounting for unexpected changes. Starting last year, we've conducted a search for companies that could work with us on upgrades to AO3's infrastructure. We've collaborated with two companies so far on preparing for our much-needed Rails upgrade, and look forward to expanding our contracting projects this year. If you have any questions about the budget or the OTW's finances, please contact the Finance committee. We will also be hosting an open chat to answer any questions you may have. This chat will take place in our public chatroom on April 9 from 5 to 7PM UTC (what time is that in my timezone?). 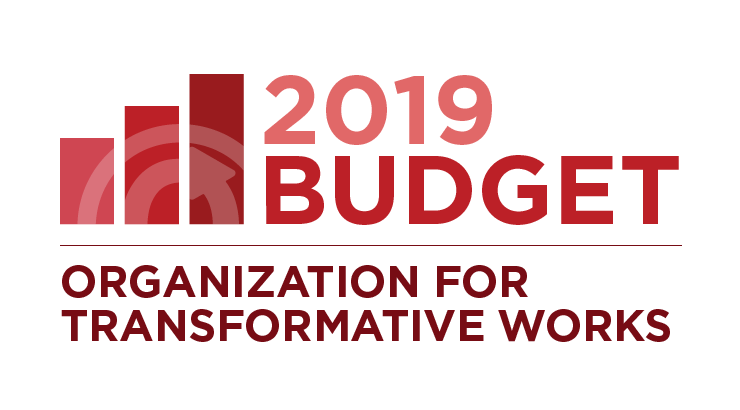 In March this year, the OTW published its first official budget. Since then, our Finance committee has been rebuilt by volunteers who have non-profit and/or accounting backgrounds! They've been busy working with other committees to reorganize and rebuild key internal processes for bookkeeping, budgeting, tax filing, and general financial policies. This improvement is a work in progress for us as an organization, and we've already learned a lot since March about how to forecast our expenses and income better. Because of that, we're publishing an updated version of the 2016 budget that better reflects our current financial situation (download 2016 updated budget spreadsheet). Most of the OTW's expenses go towards AO3 upkeep, including the bulk of our server expenses (new purchases and ongoing colocation and maintenance), website performance monitoring tools and systems licenses (access all program expenses). The amount allotted for the original contractor for the Archive of Our Own in the March budget has been reduced due to time constraints. Both the Accessibility, Design & Technology and Systems committees plan to seek new contractors before the end of the year, and next year's budget will include more accurate forecasts for their work. Legal's expenses consist of filing fees and travel expenses for panel presentations (access all program expenses). 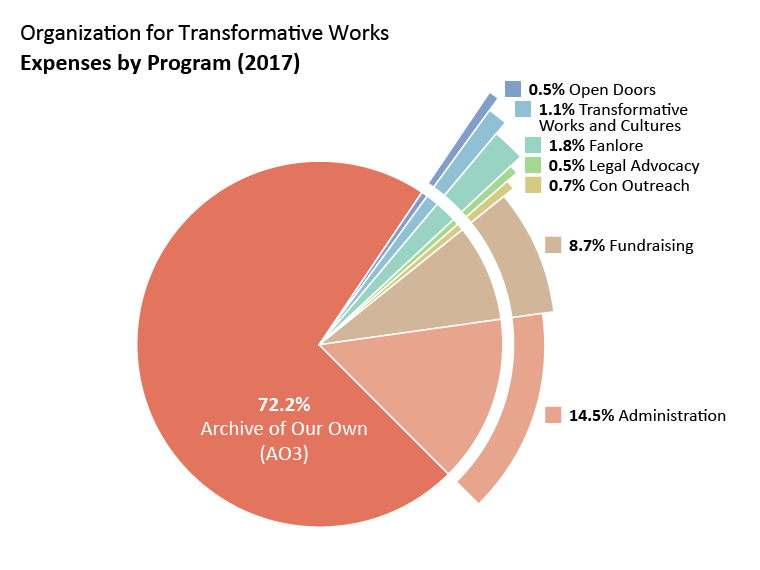 Transformative Works and Cultures' expenses are its allotment of server costs and fees associated with the journal's publishing and storage (access all program expenses). This year's expenses for Open Doors are hosting, backup and domain costs for imported archives (access all program expenses). Our fundraising expenses consist of transaction fees charged by our third-party payment processors for every donation, thank-you gifts purchase and shipping, and the tools used to host the OTW's membership database and track communications with donors (access all fundraising expenses). The OTW's admin expenses include hosting for our website, trademarks, domains, insurance, project management, communication and accounting tools, as well as contracted services for CPA assessment and tax filing (access all admin expenses). We worked with a CPA to receive an initial assessment of our financial situation and procedures earlier this year, and with an external tax preparer to file our taxes. Having completed both of these, we don't foresee needing other external financial services until next year. Finance is currently organizing our ledger and processes, and will then reassess the best setup for external services in the following years. 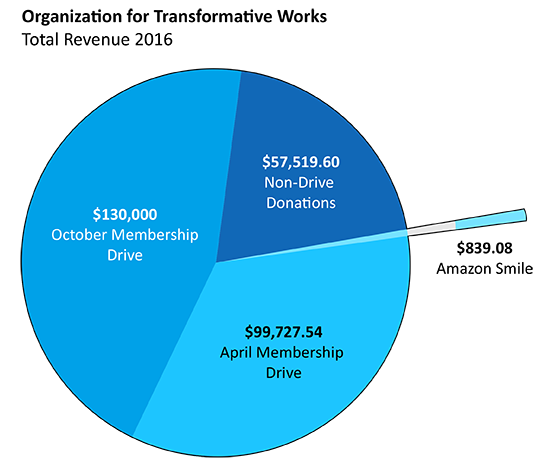 We're aiming to raise more than our projected expenses for this year, which should help cover us until next year's April drive (including a new server! ), plus increase our reserves by about US$30,000. The Finance team is currently looking into the best possible low-risk investment options for the OTW's reserves; our 2017 budget post will provide more details regarding our reserve policy, such as how many operating months we can sustain with zero donations and under what circumstances committees are allowed to request reserve funds for spending. If you have any questions about the budget, contact the Finance committee. We will also be hosting an open chat a week from today to answer any questions you may have about the OTW's finances. This chat will take place in our public chatroom on Sunday, October 2 from 20:00 - 21:00 UTC (What time is that in my timezone?) Update: Here's the link to our chatroom. To download the OTW's updated budget for 2016 in spreadsheet format, please follow this link. The budget can be found on the OTW site. It was prepared taking into consideration project needs, committee requests and our regular expenses from past year, and covers all expected expenses necessary to keep the OTW running in 2016. It anticipates fundraising income (including income from drives and other fundraising sources) of US$303,750.00, which is consistent with recent years' income. 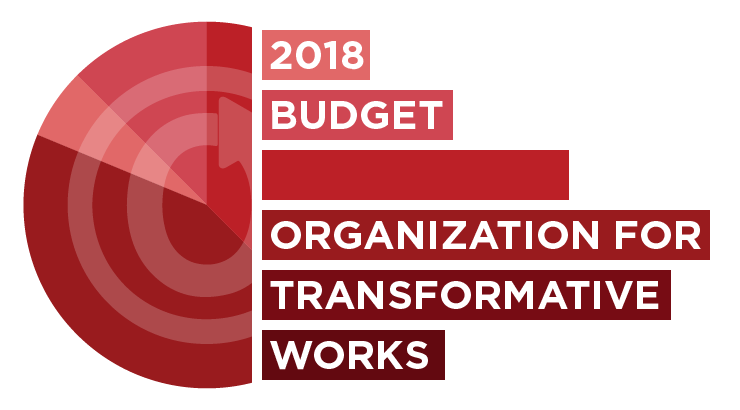 This budget also addresses the OTW's need to keep a reserve on hand for emergencies, such as a sudden need to replace a server, or other unexpected costs. To the extent that the OTW may face unexpected expenses during 2016, they will be paid from the OTW's reserve funds. With that in mind, we believe the most prudent course of action is to make sure we are able to raise enough money to cover our annual running costs (expected to be US$303,750 this year) without having to use our reserves, keeping those for emergencies and hardware investments. Follow this link to access the OTW’s budget for 2016.